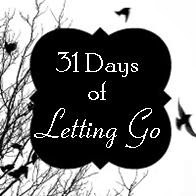 I am half way through this 31 day project of letting go of stuff and I have a trunk full of bags and boxes and more of the same sitting by the front door waiting to be carried out. You know from Day 8 I was having a difficult time making the decision of what to do with it all. Today a plan came together with a friend and everything I've managed to purge so far will be gone by tomorrow this time. I know that will be a milestone and even tonight it feels like the burden is lighter. I haven't said much about grace in these posts about letting go even though the title of my blog is "In Praise of Grace". It was the"grace calls us to change" thought from Max Lucado that started me on all this and it just occurred to me that there is a line of a hymn that says, "grace will lead me home." Is that from Amazing Grace? Tuesday is our day for Bible study and there is a verse from our lesson today that is wonderful for me to write out and remember. 2 Corinthians 9:8 says "God is able to make all grace abound to you, so that in all things at all times, having all that you need, you will abound in every good work." I need that assurance. I am glad I found it today. Because of Bible study on Tuesdays, I don't have much time at home. There wasn't a chance to work in the guest room or do anything other than load and unload the dishwasher and start a load of clothes. But this verse is a treasure and I am glad I found this promise. I will count on it to work hard on this 31 day project and not give up when those 31 days are over.